Why not? I would like to use the word ‘fun’ more, especially as it pertains to feminist gatherings and events. I’m not alone. “Yeah, a lot of feminist events and topics can be a bit humourless,” observes Loud Women founder Cassie Fox, albeit respectfully. I think I may have found a credible source of feminist fun to bring a little lightness to championing the cause, as it were, from time to time. Loud Women’s Fox is positive. Her voice has a positive tone. The language she uses is positive. And she offers to fit in interviews after working all day, slap bang in the middle of her kids’ teatime, to accommodate time differences. Only a positive person would attempt to do that. I would say I get the impression her feminist glass is half full, but with Fox having been a musician in numerous punk bands, both in the past and present, I’m guessing she doesn’t do much by half measures. 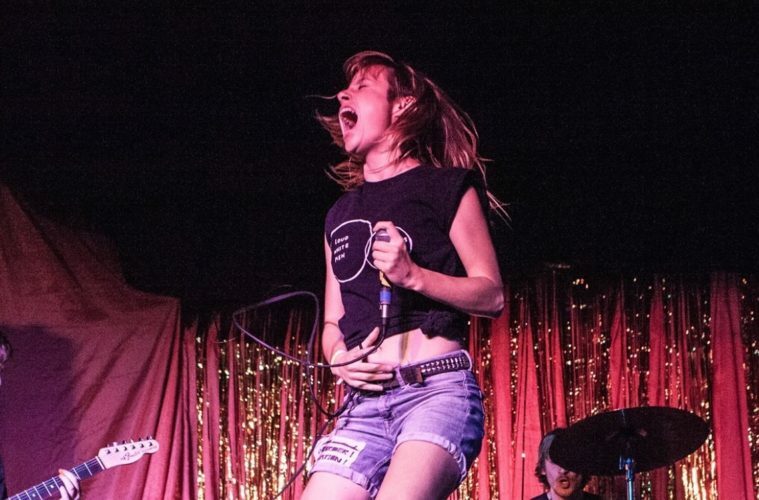 Loud Women came into being as a festival when Fox and her friends (who were also in bands at the time) came to mutually recognise how limited room for women in their local London music scene was. “We wanted to play at an event where we felt part of it, rather than being a token female band or an opening act,” she explains. 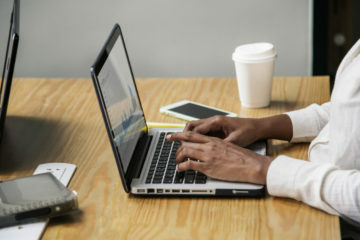 Loud Women’s social media accounts enable an online interaction between women interested in music from all over the world and provide a way for these women to share tips, resources and encouragement. The Loud Women team also regularly update a recommended listening list on their website as well as creating and distributing a monthly ezine in a distinct do-it-yourself (DIY) style. Compilation albums containing songs performed by a variety of the female musical artists and bands championed by Loud Women are also periodically created, promoted and distributed. Loud Women is a truly grassroots-founded and volunteer-led initiative however, as their success continues to grow, so does the need for support. Three individuals have recently been hired to oversee the regular monthly events. “We’re doing so much but it was important to me to not take our eyes off of our regular gigs so we now have staff to help with those events,” Fox explains. Creating a space where performers and attendees feel safe and welcome has also resulted in the education of venue staff. After reports about negative behaviour on the part of venue workers at the first festival, Fox and Loud Women approached the venue management team and the outcome proved positive. “We worked very closely with the venue to improve their awareness of what a safe space looks like. There’s an accountability aspect on the part of the venue to ensure that their space is a safe space.” Fox describes how their events are trouble-free, thus venues like having their group as clients. This has resulted in promoters reaching out to Loud Women for advice on how to best go about creating safe and inclusive spaces for their events. “Part of our remit is now talking about what gigs could look like,” explains Fox. 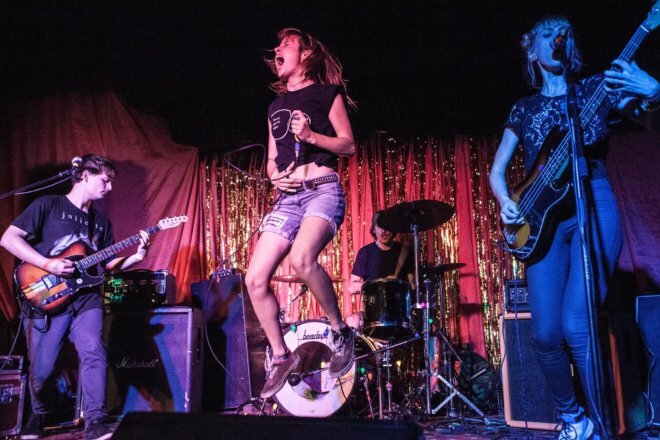 Loud Women also supports gigs featuring female musicians and female-led bands outside of London. This is realised by Loud Women sharing their advice with other groups and artists looking to set up similar initiatives, and by endorsing gigs in other towns and cities that provides a level of connectedness and support. 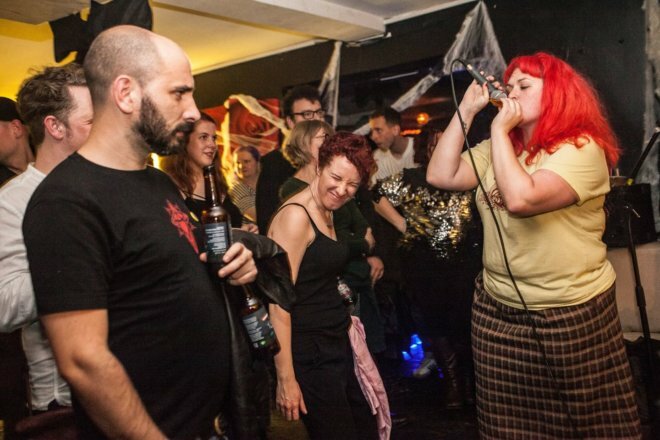 Other groups and gigs Loud Women have supported or have collaborated with include The Lady Luck Bar in Canterbury, Kent, Le Pub in Newport, Wales and Fallopian Tunes in Brighton. Given that Fox is involved with several bands, her tours around the UK also enable her to reach out to artists in other communities and connect through feminist music efforts. Not ones to keep quiet, Loud Women’s initiatives are also projected beyond the UK. The organisation has been approached by groups in the US and Europe, and later this year the team will be collaborating with an organisation based in the Netherlands, ‘Girls Go Boom,’ to facilitate the first Loud Women event in Rotterdam. “We’re always happy to work with other promoters and groups doing similar work in the field to support each other’s efforts and women in music,” states Fox. 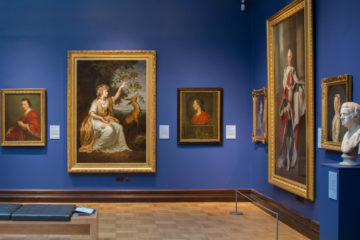 Loud Women also now incorporates other art forms into their events, such as spoken word poetry, to broaden potential audience appeal although they seem to have a rather loyal and ever-growing fan base. “We’re lucky that we have a crowd that turns up when they know it’s a Loud Women event even if they don’t know who the bands or artists are, they know it will be a good night.” And fun no doubt. Loud Women Fest 2018 is scheduled for 15 September in London. The feature image is a close up of the Petrol Girls photograph. Image one is a selfie of Cassie Fox (centre) flanked by Lorna (left) and Abby (right). 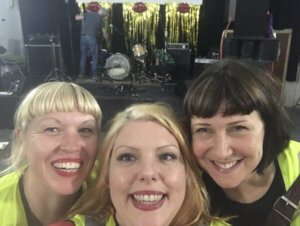 The three have been captured setting up for the main Loud Women fest in 2017. Photo by Cassie Fox. Image two is of Petrol Girls performing live at Loud Women fest. The singer is leaping in the air. Photo by Keira Anee. Image three is of Tegan Christmas of the Ethical Debating Society performing live at Loud Women fest. Christmas has bright red hair and is pictured directly next to the front row of the audience, up close to them. Photo by Keira Anee.